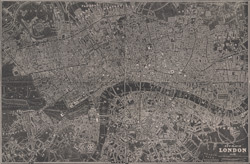 Map scale description: 3 1/2'' : 1 m.
This map appeared in the "Guide to Knowledge" anthology of 1839. The map's title, imprint and scale bar appear at bottom right. It shows the proposed Thames Tunnel, linking Wapping and Rotherhithe, as well as the Hungerford Bridge and the Greenwich and Birmingham railway lines.